Jon Krier was six-years-old when he found his first skull. He was on a walk with his mother in Wales, Alaska where his father worked as a surveyor. “She immediately told me to put it down,” he said. But he couldn’t shake his fascination: Where did the skull come from? Why did it have so many holes? Years later, after interviewing an elder, he learned that the area was the site of an ancient battle between the Siberian Yupik and Iñupiat tribes. Jon’s curiosity into humanity’s past grew throughout his childhood as he wandered the plains of Alaska, conducted experiments with the science kit that he toted around, and dissected animals he found. After a detour in the security field in his twenties, Jon returned to college to study his passion, archaeology. He’s currently a Master of Arts candidate in Applied Anthropology; his primary research focus lies in helping locate former settlements along the Oregon coast and the Bering Sea. 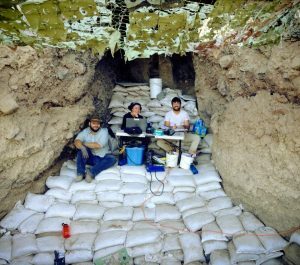 Under the direction of his advisor, ecological anthropologist Drew Gerkey and archaeologist Loren Davis, Jon uses geographic information systems to recreate ice age landscapes as far back as 20,000 years. The goal of this project is to predict the location of underwater archaeological sites off of the Oregon coast, as well as his childhood home along the Bering Sea. Jon volunteering at the 2014 Connley Caves Field School, where he’s been volunteering for the last three years. These predictive models are a potentially important key in locating possible underwater sites. Coastlines have shifted over the last 20,000 years, making it difficult to find and excavate former coastal settlements. If located, these sites can preserve important artifacts of the lives of our coastal predecessors. 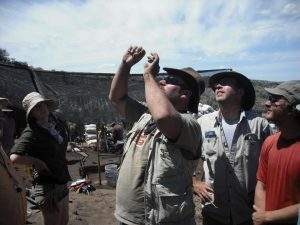 Jon is also invested in employing native historical and cultural knowledge in his research. For a recent project, “20,000 Year of Isostatically Adjusted Paleoshorelines for Northern Oregon: the Tillamook Peninsula,” Jon worked with Confederated Tribes of Grand Ronde to incorporate traditional knowledge into his research. The Tribes’ input included identifying place names and culturally important locations into the models. This helped researchers understand the cultural, geographic and natural resources of the area. 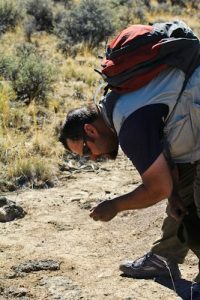 Jon inspects an artifact he found on a survey. To learn more about Jon’s research and his journey to graduate school, tune in to hear our conversation on Sunday, January 29th at 7:00 pm on 88.7 FM KBVR Corvallis or listen live online. This entry was posted in Applied Anthropology on 2017-01-27 by Mackenzie Smith.